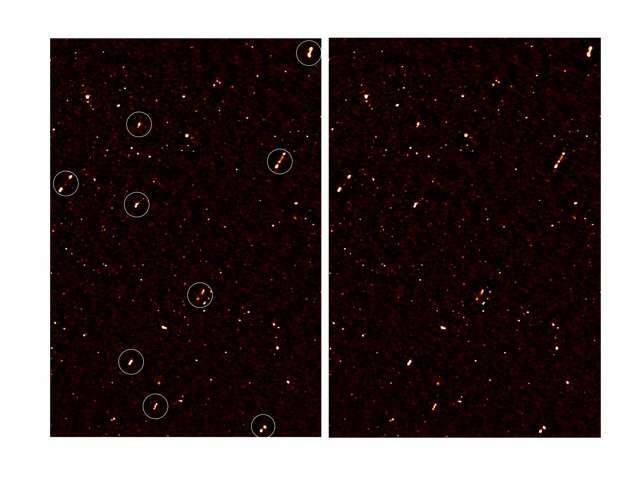 Deep radio imaging by researchers in the University of Cape Town and University of the Western Cape, in South Africa, has revealed that supermassive black holes in a region of the distant universe are all spinning out radio jets in the same direction – most likely a result of primordial mass fluctuations in the early universe. The astronomers publish their results in a new paper in Monthly Notices of the Royal Astronomical Society. The jets are produced by the supermassive black holes at the centres of these galaxies, and the only way for this alignment to exist is if supermassive black holes are all spinning in the same direction, says Prof Andrew Russ Taylor, joint UWC/UCT SKA Chair, Director of the recently-launched Inter-University Institute for Data Intensive Astronomy, and principal author of the Monthly Notices study. "Since these black holes don't know about each other, or have any way of exchanging information or influencing each other directly over such vast scales, this spin alignment must have occurred during the formation of the galaxies in the early universe," he notes. The finding wasn't planned for: the initial investigation was to explore the faintest radio sources in the universe, using the best available telescopes – a first view into the kind of universe that will be revealed by the South African MeerKAT radio telescope and the Square Kilometre Array (SKA), the world's most powerful radio telescope and one of the biggest scientific instruments ever devised. UWC Prof Romeel Dave, SARChI Chair in Cosmology with Multi-Wavelength Data, who leads a team developing plans for universe simulations that could explore the growth of large-scale structure from a theoretical perspective, agrees: "This is not obviously expected based on our current understanding of cosmology. It's a bizarre finding." It's a mystery, and it's going to take a while for technology and theory alike to catch up. "GMRT is one of the largest and most sensitive radio telescope arrays in the world," notes Prof Taylor, "but we really need MeerKAT to make the very sensitive maps, over a very large area and with great detail, that will be necessary to differentiate between possible explanations. It opens up a whole new research area for these instruments, which will probe as deeply into the and as far back as we can go – it's going to be an exciting time to be an astronomer." "We're beginning to understand how the large-scale structure of the universe came about, starting from the Big Bang and growing as a result of disturbances in the early universe, to what we have today," says Prof Taylor, "and that helps us explore what the universe of tomorrow will be like." And yet another slice away at the thought that Magnetic Fields cannot extend that far, that such cosmic events cannot be be connected like this due to the distances involved. Well, it appears to not be the case, and facts are piling up on the plasma/magnetic universe. Not saying that Gravity does not play it's part, and even though radiative energy drops off faster than gravitational, the electromagnetic energy involved is usually several orders of magnitude greater than the gravitational quotient involved and so the actual distance of the effects from magnetism can be far greater than that of just gravitation alone. Totally counter productive when simulations are run without knowledge and data. Garbage in garbage out, and you end up with speculative conclusions that people perceive as science. Not much testable science on this scale anyway. I believe you meant Faraday Rotation? Re: "most likely a result of primordial mass fluctuations in the early universe"
This is an absolutely meaningless statement as it is intended within the specific context of this gravitational framework, YET THE OBSERVATION PLAINLY UNDERMINES THAT FRAMEWORK. Let there be no doubt that the authors of this press release not only understand this, but also that this "most likely" claim is intended to pre-empt any "disruptive" thoughts held by the public. The article is plainly presenting a defense while simultaneously pretending that there is no competing cosmology which they would ever defend against. What is sad is that many physics graduate students probably never make it to the point of seeing through this pretense, as they are struggling to simply memorize this framework, as they've been tasked. This finding pretty much disassembles the BB "theory", won't stop creationists from continuing down the failed path though. Two thoughts, they're either immersed in the same intergalactic Birkeland current or they have electric fields and are behaving as electric dipoles as mentioned in the linked article. "Reucroft hints at other effects too. He points out that this model treats galaxies as electric dipoles. That implies that clusters of galaxies might exhibit attractive dipole–dipole interactions, like the alignments that occur between polar molecules, such as hydrogen chloride." Re: "This observation supports the Big Bang model instead, at least phenomenologically. If the galaxies found will not be collinear, then such a long-distance structures could form only at their shrunken state, which would support the concept of omni-directional expansion of space-time in the past - at least at the local level." Anything is possible when the weakest force is forced to assume the role of the strongest. Slowly but surely is cosmology and generally physics becoming a joke. I disagree that these black hole cannot sense each other. We have not defined that a field does not exist, i.e. the field caused by the entire universe. Since these black holes don't know about each other, or have any way of exchanging information or influencing each other directly over such vast scales, this spin alignment must have occurred during the formation of the galaxies in the early universe," he notes. Why on Earth would a scientist make a statement like this??? So frustrating. Re: "I disagree that these black hole cannot sense each other. We have not defined that a field does not exist, i.e. the field caused by the entire universe." The new normal is that it is now okay to just make sh*t up as you guys go along. This is not science, folks, and you're at this point in competition with stoners everywhere who will see your black holes in multi-dimensions breeding dark flows, and gladly raise you on all of it. "A large-scale spin distribution has never been predicted by theories "
Hm, never studied Gibson's gravitational hydrodynamics, or, as he calls it, hydrogravitodynamics? A result of cosmic vortices. well, Hannes, we've now got fractional electrons, or quantum fluids to deal with. Which takes us to these sort of interactions we are dealing with, regarding the massive black holes. Which takes us to spooky action at a distance. Extra-dimensional interactions, ones that are out of time, is one possible direction to test. Science, as you know, is not a popularity contest, nor a feel good story based in desires. It's a logic puzzle, which most have problems with - Intelligence not being the norm, and all that. Small wonder there is so much projection in science, when it comes to the darkened edges. Imagine that all black holes have jets. That these jets reflect that the singularity point is a sink that absorbs particles round the black hole and a source that emits particles out the poles. Regard this as a variation of one mechanism the steady state theory could have involved ... sinks and sources being of the nature of our universe. What of, then, the types of particles that such a singularity point could be? Would it be a timed automata that sends out some particles through the north pole and others out the south pole? Is it, perhaps, a variable mass particle, which has a spectra of possible masses dependent on the history of particles absorbed since its creation? And, in gravitational interactions, as particles are absorbed, are the lepton numbers and baryon numbers conserved or broken; if broken, what side effects of these number breaches might exist? The spin alignment of the cluster of galaxies mean a common inheritance of the spin after daughter galaxies were ejected from one spiral parent galaxy along the minor axis; according to the Arp-Malek ejection hypothesis of "breeding galaxies". The ejections were propelled by the large-scale annihilation energy of chance-accumulated matter-antimatter patches within the mother galaxy. The daughter galaxies were eventually stopped at some distance due to gravity and grew on their own increasing the family group numbers and so on, forming the clusters, all sharing the same spin. The sudden ejection process did not effect the spin orientation of the daughter galaxies; hence the common spin orientation. The galaxies grow due to new matter-antimatter being created at the core from the virtual particles of the quantum vacuum, facilitated by the high concentration of matter and energy at the core. The local group of galaxies probably are all daughters of the Milky Way and may share the same spin direction. I am not sure whether spin directions of the local group of galaxies have been measured. An observation in our own neighbourhood could substitute the observation of faraway galaxies, or at least could attest to a dialectical evolution of the infinite universe, rather than a one-time Big Bang creation by a God fairy! Re: "well, Hannes, we've now got fractional electrons, or quantum fluids to deal with." 1. What you see are jets in the radio spectrum. 2. That radio spectrum is mostly synchrotron, which is electrons spiraling in a magnetic field. 3. That suggests that the filaments are electrical currents and there's no doubt that these filaments are indicative of the plasma state for matter. 4. Everything beyond that is inferred -- including the black hole -- as a consequence of gravity's unfortunate weakness. We are told by the experts that there are no electric currents in space -- except when a black hole is present to cause it. Further, the jets make the black hole completely irrelevant -- just as they make gravitational cosmology irrelevant -- BECAUSE THEY EXTEND THE ELECTRIC FORCE FAR BEYOND THE REACH OF GRAVITY. Maybe the dark matter between our observational point and the destinations is causing a kind of polarization filter so it appears to us this way. Suspect KBK is on to something with extra-dimensional interactions' and their putative unique fundamental particles and forces. Another fundamental force or two acting interacting in eleven dimensional super space maybe supply the needed interactions with sufficient force. In magnetics, poles of micromagnets line up with magnetic field lines.. Maybe these line up with a vector cross product of aforementioned 11D space that analogs to a 'gravitational field. or better yet, explain why they would not align! Would not any magnetic field seek to not cross lines unlike our so called scientist cross lines by blaming something unknown and unlikely and unprovable and unobservable. What is sad is that many physics graduate students probably never make it to the point of seeing through this(...). All in the same direction, eh? I hope that these researchers are open minded enough to accept whatever results, even if it points to EU. I'm starting to suspect there's something to it. There are 9 circles fairly close together in the photo. Scientists are well known for making cute statements. NASA scientists, in particular. .........statistical probability. Take the same picture from a different angle & you will see the ones highlighted here drop out even as you observe different ones show up. But of course getting pictures at a different angle..........well you figure it out. So, take note, all you "I'm a holy crusader against the cranks" types, that you are increasing, not decreasing their frequency of posting by arguing with them. In B Mod, that's called reinforcing behavior. They're mentally ill losers. What's your excuse for suborning them? No.impulse.control. No.frustration.tolerance. In other words, another kind of mentally ill poster. Just one that happens to have more of the facts right. Gawd I hate crank trolls! (hence the user name) WTF is this, some kind of crazies convention? Man, I wish they WOULD all get in one spot. It's the only way they'll ever contribute to the human race. Which means they'd never do such a thing. Unfortunate. Yeah, well Plato would tell you to go bugger yourself. Hard. I detest "Socrates quotes". THEY DON'T EXIST. Kind of a give-away that someone is just making it up. We have not one written iota from Socrates. We have what his student claimed he said. Yeah. I'd be real comfortable with that as a legacy. Ferchrisake, have you ever seen what students write that you said?!? He may have written "Clouds", a play. And I have NEVER ONCE heard a "Socrates quote" that was from Clouds. There's feckless, unfreakingbelievablyfeckless and then there is Hannes et al. that are utterly and totally without any possibility of the slightest possibility of feck! The paper this article is based on adds further evidence to support the conclusions of the one I have just linked. It would be very interesting to know whether there is a discernible filament that contains these galaxies, or if they are in multiple filaments, whether those filaments are aligned. Cherukuri realized a redesigned Tesla coil could create a powerful force field at distances far greater than anyone imagined. His team observed alignment and movement of the nanotubes several feet away from the coil. "It is such a stunning thing to watch these nanotubes come alive and stitch themselves into wires on the other side of the room," he said. I have as much proof as you do who claim He/She/IT didn't! Also, I have Dense Aether between my ears!!! That would be observational evidence which supports the EU/PC POV, of course the filaments are Birkeland currents. The filaments and sheets are a natural result of plasma, sadly these phenomena are not predicted, explained, or otherwise using the physics of the standard theory. now, i've sent a means to moderate the site to the site admin... perhaps you should advocate for it? shall we discuss evidence relating to your moon craters? Cassini being fried by discharge? Grand canyon formation? your "plasma discharge killed D/1993 F2" claims? Does a 4d sphere have a 3d equator, or some sort of geometric property that can be considered a higher dimensional analog to a property of classical shapes? is Hannes et al. that are utterly and totally without any possibility of the slightest possibility of feck! OK, calm down. Don't forget the connotation and the manner it is annotated. We all make mistakes. Just think, sea of reeds vs red sea! Now we have QM and Dr. E.
Black holes, gravity, bah humbug. what is charge? For general information, as I have seen some ask about measurements in '4D'. Well, we live in 4D space-time, 3 dimensions of space and (at least) one dimension in Time, which for us is linear and shows as moving only in one direction. It can almost be viewed as a tetrahedron where 3 edges and their planes give the X, Y and Z axis/planes with just the (were one sitting on your desk or table) 3 edges and planes facing up from the table, the bottom plane can represent time as it affects each of the other planes equally. It could be fairly said that if you straightened one corner out so that the lines/planes came together at all 90 degree angles, that the plane for time would have to be a curved surface at a radius the same length as the arms of the X-Y-Z 'Tetrahedron's lines. Given this, time is scalable for the entire universe, very fast at tiny scales and ultra slow at larger ones, but C is the Constant: Lightspeed. Your imagination and reality are two different things. There does not exist an emptiness; else, you would not exist. First, get your head around that, i.e. re-think. There is no time without motion. The protons and electrons are never created or destroyed and the fields are constantly being updated only due to motion. So what you see is a result, not the "thang". The point of charge is nothing without another and motion. I would not try a definition of what I resolve due to my learning. This has never been taught. Well maybe, but not understood. So think of no boundary conditions, an infinite and infinitesimal field at a point. Don't even try to create a geometrical equality with a space time knot or ... juz accept it. Actually, Hyper, my statements on 4D as being time and scalable as such compared to the other 3 axis of space goes right along with your paper where you state that for tiny scales a human type view would seem extremely fast for us at our scale would be something taking billions of years on the micro-minus scale and the same going for scales that much larger than our own, IE we, ourselves exist somewhere within the mass/energy of an electron or other sub-particle and see it as our entire Universe. All a matter of fractals, their iterations and the expressions of energy along the lines formed by the existence of and the growth of the fractal over time, that being part and parcel of the fractal structure we are trying to study under the heading 'Physics'. Was not in opposition to ye at all, more explaining for those who may not have a solid grasp of the subject and giving a stable reference point to the rest. I would expect Time to be experienced as a matter of scale, and that seems to hold true for various life forms on Earth, in general (there are always outliers) but I would expect that this holds true at the Hyper-Giga-Parsec Level as it does at the Pico-Planck (Think about That One) Level. That is why I consider Time to be one of the few actual Constants that we have. It can be Observed at different scales, and certain things can affect it, such as High V, but that V carries speed as a part of it's function and is a way of showing it's measurements in the other dimensions.